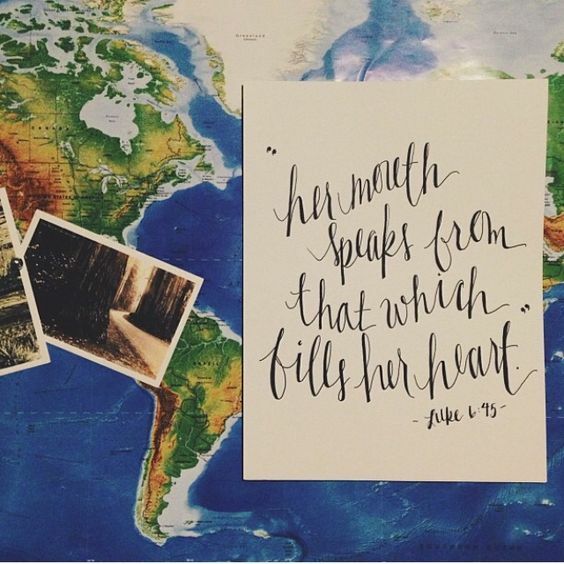 I found this scripture on my Pinterest, where I have a board full of my favorite scriptures I’ve found, and I’d love to get the chance to write about more of them. This scripture speaks to me because something that’s been on my mind and heart a lot this year is that where you spend your time and energy, you spend your life. Along the lines of this scripture, you live out what’s inside your heart, which has a reciprocal effect, because how you life your life then effects what’s in your heart. For me, I hope that I can live in such a way that I can bring out “good stored in [my] heart” and not evil. With everything going on in the world, it’s easy to be overwhelmed by the amount of evil and hate, and it seems that any good is completely covered up by it all. The world needs love now more than ever, or the cycle will continue of “evil bringing out evil”, instead of good bringing out good. One of my goals this year has been to be more positive and to love more, so this scripture is only I really love, because the same idea comes straight out of the Bible. Thanks for reading, I hope your heart is full of good this week!